This November, as we remember those who served in our military forces, as well as the 100th anniversary of Armistice Day, the Genealogy Division has made some new materials available through our Indiana Digital Collections about an Indiana soldier, Fred C. Hurt, who served in the Spanish-American War. These materials are a part of the G034 Nancy H. Diener Collection which was recently processed by staff. Fred Carlton Hurt was born in Waynetown, Indiana on July 28, 1876 to Dr. William J. and Susan C. Hurt. Fred followed his father’s career path and entered the Indiana School of Medicine. While he was in his second year of medical school he decided to enlist in the U.S. Army Hospital Corps. 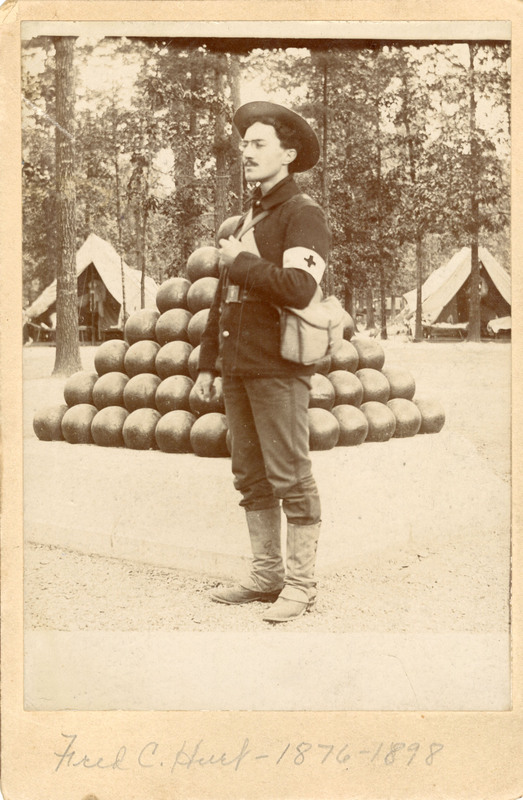 Fred joined the U.S. Army as a private on June 14, 1898 in Indianapolis and was sent to Camp Thomas in Chickamauga, Georgia. 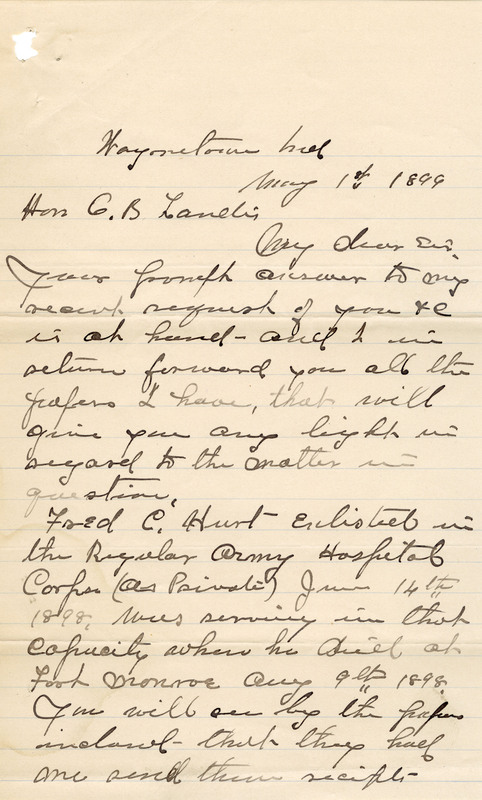 During his time there he wrote home to family and his fiancé Gertrude Jachman, telling them about camp life, and his work tending to the sick, which he really seemed to enjoy. Fred also wrote about how he was expecting to be shipped out either to Puerto Rico or Cuba and was anxious to go. 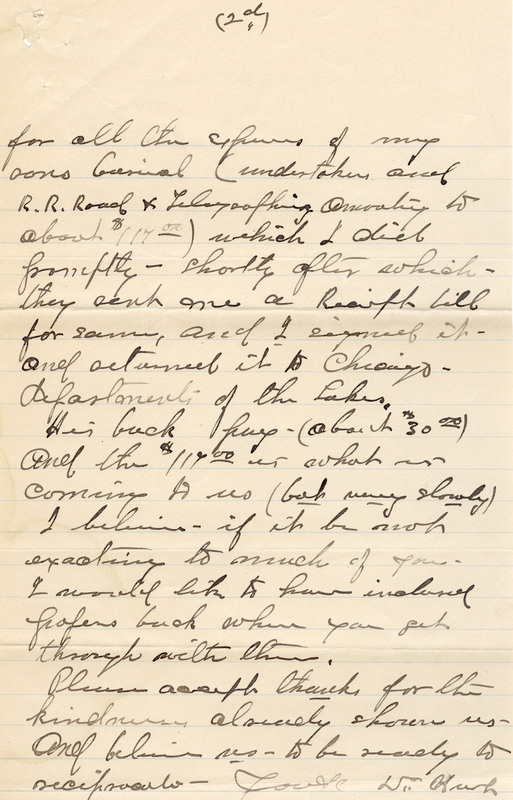 Fred wrote that the camp was rife with disease and understaffed. In late July, he wrote “At present we have 150 men men (sic) who are bad sick. There are only 10 men who go on duty at one time to take care of 150.” Fred himself would succumb to typhoid fever at Fort Monroe in Virginia on Aug. 18, 1898. 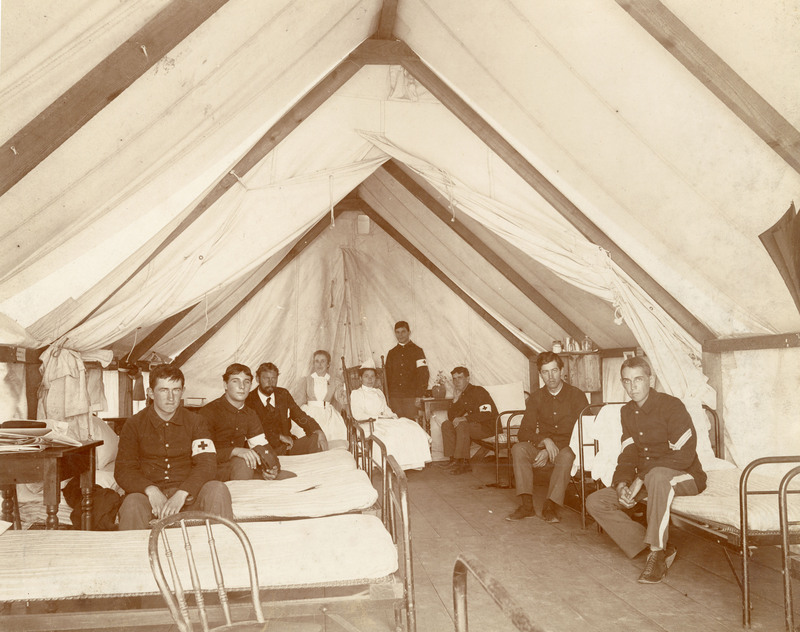 Inside of medical tent with personnel at Fort Monroe. 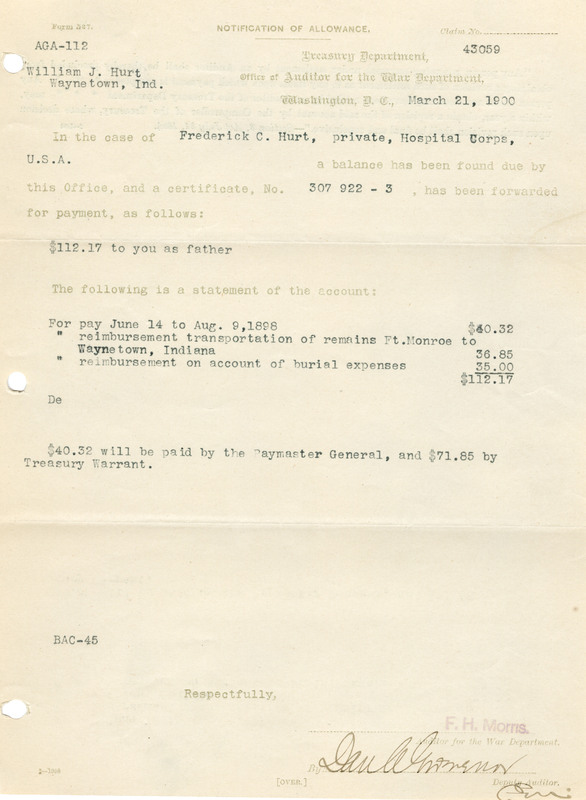 Fred’s family in Waynetown were unaware that anything was wrong until the received a telegram sent collect that Fred was dead, his body was later shipped home collect and the family was billed $117. His father William sends letters to various government official trying to rectify that matter and get reimbursed for the funeral expenses and transport of his son’s body home as well as back pay owed to his son. 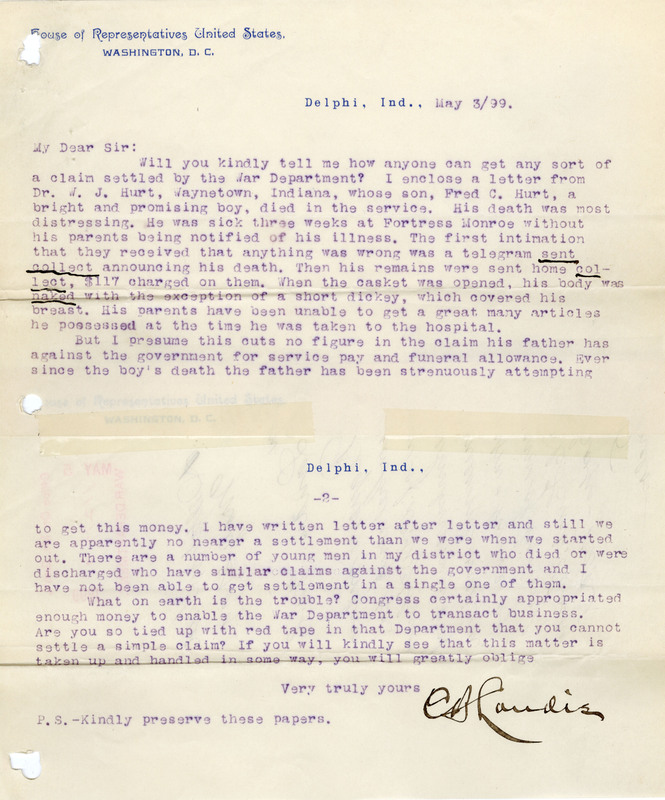 On May 1,1899 he sends a letter to Charles B. Landis a representative from Indiana’s 9th District asking him to look into the matter. 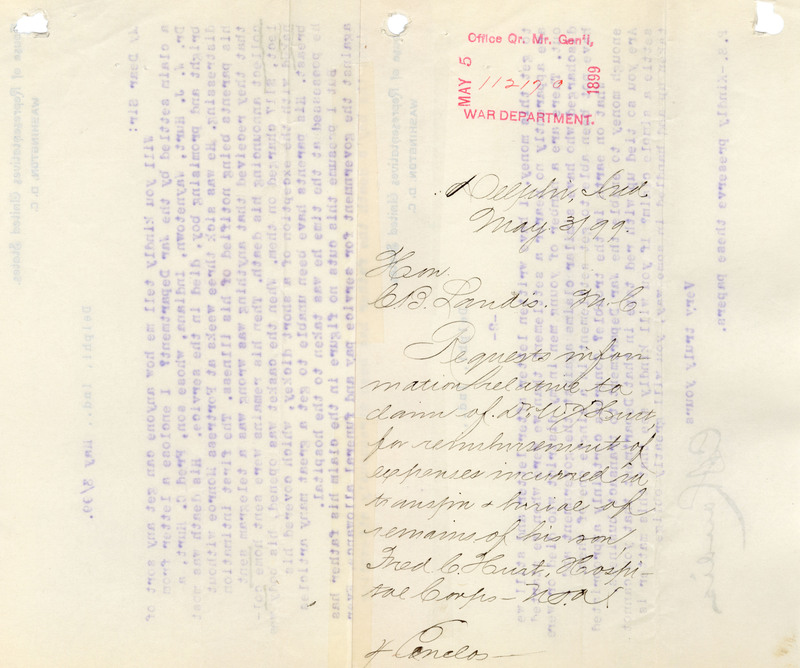 On March 21, 1900, a letter from the Treasury department states that they have approved payment to William J. Hurt to amount of $112.17 for back pay and reimbursement of expenses involved with the transport and burial of Fred C. Hurt.